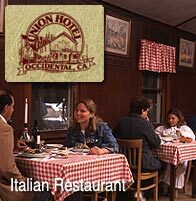 Occidental lies just away from the Russian River in the surrounding hills. The main street is home to many great restaurants and art galleries. the famous Negri's in particluar draws visitors from all over. Also great choices are the Union Hotel and Howards Cafe. Bohemian Connection The Bohemian Highway is one of the most scenic drives to be found anywhere in California. Occidental Choir Founded in 1978 in Occidental, the choir is a local treasure known for composing and performing their own music. Occidental Chamber of Commerce The town of Occidental is made up of both old-timers and new residents. Aside from its excellent restaurants for a town of its size, Occidental is home to unique gift shops that sell everything from crystals, herbs and handmade soaps to toys and garden statues.